The glossy paper and coloured dyes in the supermarket specials brochure insert in the newspaper makes it hopeless for fire lighting. And no good for mulch or worms either. I took it out to put in the recycling – I hope they can do something with it – and got distracted into browsing it while waiting for the fire to catch. And then intrigued. And then on a quest, to see if I could find anything in it I would buy. Not Coke or Coke Zero or Oreos with an Olympic logo or Cadbury chocolate (owned by Kraft, and uses GM ingredients, and life is way to short for anything other than very good dark chocolate). Not Sprite or Ocean Spray Cranberry drink which is only one quarter cranberry juice and has a stunning 8 teaspoons of sugar per cup (250ml)!! And they try to tell you it’s healthy!! (Indignant huffing). Not Special K or Nutrigrain which has the dubious honour of taking out the Parent’s Jury Award for Smoke and Mirrors advertising three years in a row. Not poppers of Tropical Punch fruit drink, which has another stunning six teaspoons of sugar per popper. (One of my absolute pet hates, poppers). Not packaged biscuits with transfats or Mars bars or potato chips. Definitely not Uncle Tobys yoghurt topped muesli bars which are owned by Nestlé and have way too much sugar too. Really really not microwave soup or chicken noodles in plastic containers that is so bad even bacteria won’t eat it. Not canned tuna – I’ve stopped buying canned tuna altogether. 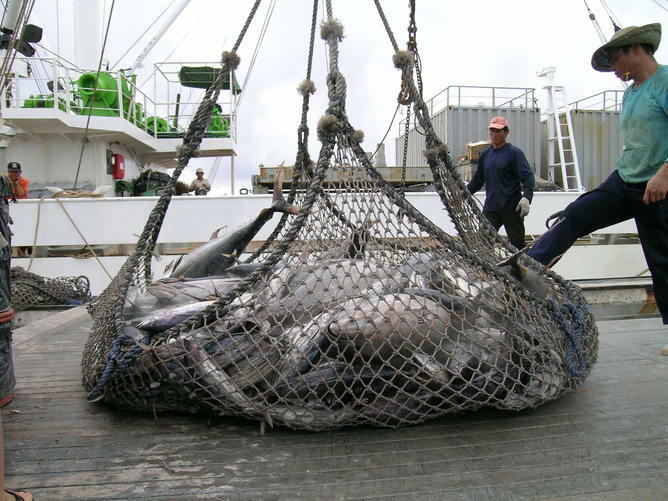 Several species of tuna are critically endangered and likely to become extinct, and although skipjack, the species most often canned, is not itself listed as endangered it is being fished beyond a sustainable level and the methods used to catch it catch more vulnerable species as well. I buy canned salmon, which is listed as sustainable for now. Not canned tomatoes any more. I used to, occasionally, when I ran out of home bottled tomatoes, but the BPA in can linings is nasty. Not rice from the Riverina – I buy local clear conscience rice. I really don’t want to be any part of the killing of the Murray Darling basin. Not Spam – ughh! Nor grated dried parmesan in a container – ughh too! Not pasta – I’ve discovered how very easy it is to make pasta, and I can use real eggs in my home-made. Does anyone buy foaming shower gel? Why? Even worse (another of my blood boil products) are those antiseptic hand washes. Basic science: bacteria breed very very fast, they are very tiny, and there are lots of them. If you only kill 99%, the other 1% will be the really vicious ones, the bikie gangs of the bacteria world. And within, oh, about ten minutes, they will have bred up to take up the niche again. I make soap once a year. It is gorgeous and luxurious enough to make good presents, and enough to last me the whole year. If I make it enough ahead to let it age, it goes nice and hard and dense and lasts forever. The last of the bar goes into a pump bottle with water and dissolves into a liquid gel that is used for hand washing. Since I just keep topping it up with scraps of my beautiful, macadamia oil soap and water, the same bottle has been going for years. Not krill oil. It’s good that there is actually some good scientific monitoring of krill fisheries going on, so it’s probably ethical. Just seems to me there are much tastier ways to spend money on Omega 3’s. Definitely not ani-wrinkle cream, although it does remind me that since it’s deep in avocado season, and we have some over-ripe ones, it might be nice this weekend to make a face mask this weekend. Not Lemsip hot lemon drink – now why on earth would anyone buy that while lemons are at peak of season? Not cat food. I like individual cats, but I really do think keeping carnivore pets is an ethical issue when so much of the world’s wild animals, specially fish (directly and indirectly) goes to feeding them. Not frozen beef pies or chicken bites or lasagna or potato fries or fake cheesecake with their transfats. Yuk. Not bacon or ham or prosciutto with their nitrosamines (though someone told me recently that at Lismore Farmer’s Market someone is selling real cured meat without nitrites.) Definitely not flavoured yoghurt, some of which have as much sugar as the “fruit” drinks – up to 7 teaspoons per little tub!! Not cherries from USA or cashews from Vietnam or oranges from South Australia or even silverbeet from Queensland. (Why would you transport silver beet, when this is about as perfect a climate and season as you will get for it?) Not bread – I have actually not bought bread at all since I became a sourdough convert. Definitely not muffins when I can make them with real fruit, real eggs, real butter, real flour. Not hommus at $3 a 200 gm tub, when I can buy organic dried chick peas for less than $7 a kilo, and organic tahini for about $16 a kilo, which works out to about 50c for a tub. It’s a bit of a rant, I know, and I usually try to steer clear of rants in here. But really, what is wrong with our food culture? That we don’t collectively all see through the shiny paper and bright (non-biodegradable) colours to the absolute junk they’re selling? There’s nothing, nada, not a thing in there I’d buy. So who buys it? Not us, either! The ‘no junk mail’ and ‘no circulars’ signs account for most of the almost-absence of junk mail. Exception is the home delivery catalogues of oriental-made crap the placers of which cannot read apparently. Anyway … one of the BLF members uses vast quantities of junk mail as water sponges in the pathways of his sand-based vege gardens. I had heard that soy-based inks are used these days or is that only in the high-end publications? Are there still heavy metals and other undesirable substances in printer’s inks? I have never thought there was a justification for junk mail and re-using the stuff for a good purpose is no reason to have it in the first place. It’s like ads on TV – the advertisers must find it pays or we would be 3 TV stations less than what we have now (no real loss ;-). And spam (the electronic kind) must pay too since it’s still proliferating. So who interacts with a spammer? Plenty do apparently. With a bit of applied thought as you have done, Linda and we can find alternatives which don’t ‘cost the earth’. Great post and so very true. Out of all of that I am still guilty for buying tin cat food. I have considered making our own cat food but I haven’t looked into this as yet. I didn’t realise cans are BPA lined. That makes me see them in a totally different light. We have baked beans in our cupboard for emergency meals but, really, how easy would it be to make up batches of home made baked beans and freeze them for quick meals. I completely agree with about all the sugar in products. It’s really bad. That’s funny 🙂 I am 9 yo and my mum showed me this. I’ve tried so hard to NOT buy but I do buy some of that stuff you write about. There are some things I didn’t know about – the krill oil situation (not that we buy that) and the nitrosamines in bacon. It’s a good lesson for us all. Making my own bread is a goal of mine. I’m getting there….slowly. p.s. nothing wrong with a good old-fashioned rant. Great rant, well put! I had my own rant today…have been weaning ourselves off the supermarkets lately, but today we needed a few things we can’t find elsewhere (yet). It made me very cranky to see a live cherry tree provided by a very good local nursery decorated with plastic cherries and CHERRYRIPE CHOCOLATE BARS…where was this spectacle? Perched atop a big pile of US cherries. What sort of message does this tell our kids when they see it? Keep ranting, someone might actually listen. At my local health food store I can most dry goods out of their bulk bins, they do a special order for my different organic flours in 5kg bags. Sourdough bread is so nice, supermarket bread would be torture!!! My local butcher is very good, hopefully next year he can butcher our own cattle . Veggies and fruit from the garden, still starting up, the farmers market is perfect to find any supplements, bees wax, honey, pecan nuts and olives. Meals from scratch, everything home made for snacks, home made yoghurt, we’re all spoiled rotten. Keep up the good work Linda, you’re an inspiration to keep up the things that make me happy at the end of the day. Every week it arrives tucked into the local paper and every week I look through the pages knowing there is noting that I would buy. I hate seeing over packaged products specifically targeted at kids like stupid (not cheese) cheese string things and we do not even have kids. It is just lots of pseudo foods in too much packaging. We have been butchering our own chickens and have a cow due for killing. I make our bread and any sweet treats or snacks we might want. We try to grow enough veggies but at the moment we still get the majority from our local farmers market. This is something we are working on. Your rant was well put it is just a shame not everyone feels the same. The only use I have found for the brochures is as weed mat under mulch covered paths. Me neither. I think you’re ranting to the converted/ Now how do we get the word out to the rest? I’m very lucky to have an organic shop close at hand to buy anything that we can’t produce ourselves. Those those antiseptic hand washes are one of my favourite things to rant about. And anti-bacterial wipes and cling wrap and i don’t know what else. They switched back to using plain soap and water in hospitals to prevent the growth of super-bugs, but we want to create them in our homes? How can those products even be allowed to exist, it’s insane! I know you don’t usually rant Linda..but I so get why you need to this time. I found these catalogues helped me notice the personal change I was going through when I realised that the ‘on special ‘items were not things I ever bought anymore. Don’t you love just how many people are not doing this kind of shopping anymore and your book probably helped that thinking along. Imagine if they didn’t print catalogues anymore and used that money to help the environment instead , now that would be a special I would buy any day!! I have a game that I play when the supermarket catalogue ends up in my letter box. I grab a pen and go through the catalogue and try to find items that I actually would buy. I normally only ever end up with less than five items. That’s when I know that I’m shopping correctly and actually thinking about what I’m buying. I live a fairly healthy and ethical life, within various restrictions including health issues and time limitations. Although I enjoyed your post, and understand you are pointing out specific items to bring attention to many very sound issues that may not be known about, there is an enormous amount of pressure on individuals and families to comply with an often unattainable lifestyle. The idea that people can attain these lifestyles can cause more middle class guilt and impose further mental health pressures on society. I do understand you have posted on a personal blog and you say this is an uncharacteristic rant, but it is important to realise not everyone is capable of living a completely ethical, sustainable lifestyle. Hi Shelley, I totally agree with you, and you’ll find me saying in my “50 things about me” and quite a few other places on this blog that I think “I think perfect is the enemy of good and being purist is dangerous, which is just as well because otherwise I’d have to totally disown myself.” I’d hate anyone to think I live a completely ethical sustainable lifestyle. Or even a fairly ethical sustainable one. I just try, tis all. As I say in the intro to this blog “this is a conversation about how to tend in that general direction, while still keeping a household, a job, a family and everything else happening.” But, having said that, I think the stuff I ranted about in this post is the (relatively) easy stuff. I find it hard to reduce my petrol use, but avoiding Spam or foaming shower gel or Coke or Mars bars is really not a problem at all! Love that post Linda. Ranting is good for the soul. And we might each know some of those implications but not all of them so it is a great read. Rant away Linda. Couldn’t agree more. Sadly, there are lots and lots and lots of people who buy all of that and more every week and spend a fortune in the process. Hear, Hear! Well said. I agree with everything you have said, and it’s not often I agree with EVERYthing someone says. Well done. my husband and I often play this game with the supermarket brochure if its lying around on the dinner table, usually we can’t find anything that we would buy! And I too hate how you can’t use them for fire or garden, what a waste sending them to us at all! PS I loved your book and I’ve written a post about it, coming soon 🙂 I have so many ideas now, I don’t know where to start!